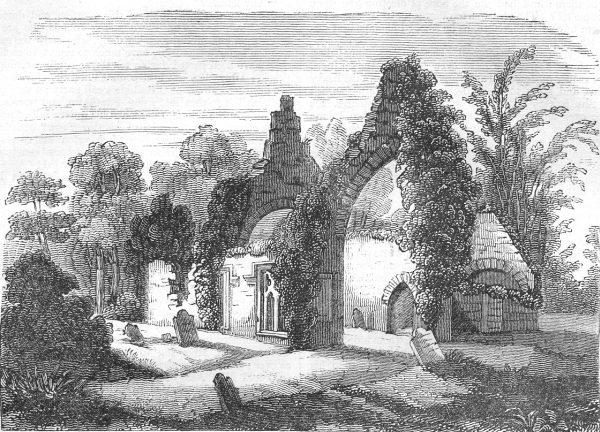 THE civil, military, and ecclesiastical antiquities of Ireland have, for several years, presented a fruitful field of research and inquiry to many able writers, who have succeeded, after much toil, and considerable erudition, in dissipating to a certain extent, the mist of indifference and ignorance that has so long shrouded their history. Still, although much has been done, the subject is still so very plentiful, the harvest is not yet exhausted; and there are yet many of these remains, which, from their situation, add considerably to the picturesque and attractive appearance of the country, yet wholly unknown or disregarded. It is true, nearly all the extensive monastic and baronial edifices in Ireland are already before the public; but there is another class of buildings that has been generally unnoticed; those small oratories which were built on spots already consecrated by the residence of an anchorite, or on the site of a decayed monastery or abbey; and not unfrequently owed their origin to the performance of a vow, or for the support of an ecclesiastic whose office it was to pray for the soul of the founder, whose tomb usually was within the walls. The church of Kilsharvan is situated about a mile and a half east of Duleek, near the banks of the little river Nanny Water, county Louth, and appears to be of great antiquity. Of the portions of the walls that remain, the most prominent are the chancel arch, which is pointed and clothed with ivy, and a semicircular arch dividing the nave from the choir. In the south wall are two windows, square-headed and deeply recessed.